Webinar: Contact Centers 2020-Driving Innovation | 8x8, Inc.
SMBs and larger enterprises. Join industry analyst Blair Pleasant, who will share strategies about how Integrated Cloud Communications can differentiate your business and help you stay competitive. Small and medium-sized businesses (SMBs) face an ongoing challenge to compete against larger enterprises that are flush with staffing and funding resources. 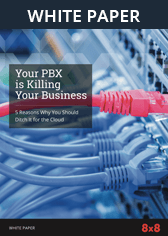 Until recently, SMBs had few choices when it came to their communications solutions – mainly, they could purchase on-premises-based PBX equipment, but this required ongoing management, support, and maintenance. Cloud or hosted telephony offerings are now available, but many of these solutions are specialized and have limited capabilities. How can SMBs compete and differentiate themselves despite the many challenges they face? 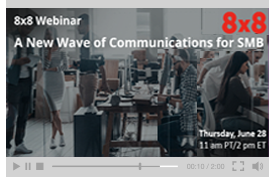 In this webinar, learn about the new wave of cloud communications services that integrate communications, collaboration, and contact center functionality into a single system of engagement, thereby leveling the playing field and helping SMBs stand out from the crowd. Join industry analyst Blair Pleasant as she shares strategies about how these new services can help you provide the customer service and customer experience you need to compete against companies of any size.